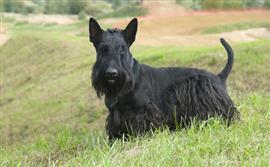 Many Scottish Terrier owners are on the lookout for fitting Scottish names. Among the most popular choices for males are Lamont, Logan, and Finley. Female owners tend to favor the names Kenzie, Cora, and Maysie. One place you might find a Scottish Terrier is on a Monopoly board. The breed has been a token in the classic board game for many years. A few ideas inspired by the Hasbro classic include Howitzer, Virginia, and Thimble. Nicknamed by the Earl of Dumbarton as 'diehard', the breed is often described as rugged and alert. Some name ideas coming from characters in the movie 'Die Hard' are Mclane, Holly, Powell, and Karl. Another interesting place to find names is from various technology that is filling households around the world. Mac, Kindle, and Nexus are just a few tech-inspired options. Some of our pages will contain a subcategory. A subcategory is a slightly more specific grouping than the main topic of the page. For a subcategory, we will include a separated table of names and corresponding descriptions. An example of a subcategory of Red Dog Names would be 'Dog Names Inspired by Red Wines'. If you have any subcategory ideas for the Scottish Terrier Names page, we would love to hear them. Use the form below to submit your ideas.